plaques (yellow) and activated microglia (red). In preclinical neuroscience research, the brain's resident immune system and its role in a multitude of CNS diseases have generated a newfound focus on its therapeutic possibilities6. Classically, the CNS has been regarded as having a relatively weak immune surveillance, due to the lack of infrastructure — notably lymphatic vessels and presence of a blood brain barrier (BBB) — as compared to that of the periphery2-4. This comparison has been shown to be inaccurate given the CNS, unlike the periphery, is highly compartmentalized with dramatic fluctuations of immune privilege between compartments3. The immune system is of particular interest to neuroscientists due to its critical role in neurodegeneration; an area of unmet medical need and repeated failures in clinical trials; currently, 2003 was the last time the FDA approved a drug for Alzheimer's Disease5,6. In particular, microglia have garnered the most acclaim given their function and predominance as the resident immune cell in the brain5. Microglia comprise approximately 75-80% of all CNS leukocytes and 5-12% of all cells in the brain3. Microglia are specialized macrophages of myeloid lineage that play a vital role in both CNS immune surveillance and homeostasis5. To facilitate this role, they have three primary functions: sensing, housekeeping, and protection from self and foreign stimuli5. Recently, new data has emerged from single cell studies on the composition of both the CNS immune landscape and microglia, which provides evidence of heterogeneity among and within a given cell population1-4. Furthermore, the emergence of a shift from steady-state to a pathological state influences this immune landscape and the subpopulations that reside within. Mrdjen and colleagues deciphered CNS resident immune cells using high-dimensional single cell cytometry and fate mapping. These cells showed diverse and distinct phenotypes that were susceptible to change based on factors such as aging and disease3. Their work revealed a significant degree of CNS leukocyte complexity, with the presence of unique surface markers characteristic of microglia, monocytes — comprised of monocyte-derived cells (MdCs) and dendritic cells (DCs), along with sub-types of each — B cells, T cells, CNS border-associated macrophages (BAMs), natural killer (NK) cells, NKT cells, mast cells, and others3. Additionally, they also found that some of these cell types can be further subdivided based on their distinct surface protein phenotypes (e.g. three main subsets of DCs differentiated by the presence/absence of three different surface markers)3,4. BAMs were not only able to be separated from microglia, but further analysis of their surface protein profiles demonstrated differential BAM populations that correlated with their anatomical location3. This evidence provides for functionally distinct BAM identities. The identified subsets of DCs may also provide for functional differences and identify the key source of antigen sampling in the CNS and/or maintenance of immune suppression2,4. Furthermore, in the identification of different subpopulation marker characteristics, the authors provide for future studies to discern their potential functional differences and their relevance in homeostasis vs. disease states. In addition to deciphering the cell population composition of CNS resident immune cells, Mrdjen and colleagues also investigated whether shifts in microglia composition correlate with age and Alzheimer's Disease. In contrast to previous literature, CD44 alone did not provide sufficient data to highlight a "reactive" population of infiltrating microglia3. Instead, the authors correlated a phenotypic signature of high expression levels of CD11c, CD14, CD18, CD44, and PDL1 with these reactive microglia populations, which were found in both geriatric and APP/PS1 AD mice3. This "reactive" subpopulation found within these two pathological states showed an overall decrease in microglia homeostatic checkpoint markers (CX3CR1, MerTK, etc.)3. Microglia were not the only cell type to experience a shift in these pathogenic states1-4. In an EAE model, both MdCs and DCs increased, whereas BAMs significantly decreased to a rectify their heterogeneous to a homogenous population state3. The pathogenic state itself can also significantly impact the degree of this CNS immune cell mobilization. For example, the state of microglia in neurodegenerative diseases (a localized response) is different than that of an inflammatory disease, such as multiple sclerosis (MS, a global response). Recently, Hammond and colleagues expanded on the understanding of microglia identifiers and their underlying dynamics from a transcriptomic perspective1. Hammond et al. recent publication in Cell looked to identify and map microglia populations from development to old age, while also observing how those populations change in response to injury. They identified nine distinct subpopulations that dynamically changed due to development, disease, or aging1. Some of these populations were transitional while others were maintained throughout. These nine populations shared three genes (C1qa, Fcrls, and Trem2) of microglia origin, however, the remaining gene expression patterns were unique, defined, and not due to contribution from a modulatory state1. The authors showed the ninth subgroup as a microglia population that appeared in the presence of injury. Additionally, in response to an injury event, other subpopulations of microglia revert back to a developmental pathway suggesting a reactivation event that is precipitated by this injury. The effect of aging produced an enrichment in two different clusters of microglia without any large-scale effects on subpopulation appearances or disappearances. OA2 (Ccl4) and OA3 (Ifitm3) were both enriched in aging mice (along with a monocyte/macrophage cluster)1. These microglia expressed multiple inflammatory signals that are not typical of other subpopulations1. Thus, in response to aging, microglia shift to a more immunogenic profile increasing both inflammatory and interferon-responsive cell clusters. Investigation of both an AD (5xFAD) and MS (lysolecithin-induced) mouse model revealed two clusters of pathological activated microglia: disease-associated microglia (DAM) and injury-responsive microglia (IRM)1. These unique populations of activated microglia were compared to determine any commonality in their transcriptional signatures. The results revealed twelve genes that were commonly shared among these pathological microglial, one such gene was Apoe (the most significant genetic risk factor for AD)1,5. However, these activated microglia transcriptional signatures also had unique identifiers with some degree of overlap in various clusters. This suggests that microglia likely respond in numerous ways to a pathological event. A gene found in OA2 activated microglia pathological cluster, Ccl4, has been shown to be upregulated in MS patients' brains1. The authors compared the transcriptomic profiles of activated microglia collected from lesions in a MS mouse model to that of human MS patient lesions1. Ccl4 was upregulated in the core of active lesions in both mouse and MS patients compared to controls1. This demonstrates that these subpopulation transcriptional signatures could have translatability to their human disease state counterparts. Much of the information gained recently on CNS resident immune cells has been due to use of next-gen technology, given the technical hurdles1-4. This combined work provides for the future use of these specific genetic and cell marker signatures (e.g. Cre-driver lines and antibodies against specific cell markers) to elucidate the functionality of this complex and heterogenous immune cell population. The potential for either the translation of these findings to a disease state, identification of a biomarker, or recapitulation of these dynamic immune cell population signatures in a preclinical model could provide for much needed advancement in the neurodegenerative space. 1. Hammond TR, Dufort C, Dissing-Olesen L, Giera S, Young A, Wysoker A, Walker AJ, Gergits F, Segel M, Nemesh J, Marsh SE, Saunders A, Macosko E, Ginhoux F, Chen J7, Franklin RJM, Piao X, McCarroll SA, Stevens B. Single-Cell RNA Sequencing of Microglia throughout the Mouse Lifespan and in the Injured Brain Reveals Complex Cell-State Changes. Immunity. 2019 Jan 15;50(1):253-271. 2. Jordão MJC, Sankowski R, Brendecke SM, Sagar, Locatelli G, Tai YH, Tay TL, Schramm E, Armbruster S, Hagemeyer N, Groß O, Mai D, Çiçek Ö, Falk T, Kerschensteiner M, Grün D, Prinz M. Single-cell profiling identifies myeloid cell subsets with distinct fates during neuroinflammation. Science. 2019 Jan 25;363(6425). 3. Mrdjen D, Pavlovic A, Hartmann FJ, Schreiner B, Utz SG, Leung BP, Lelios I, Heppner FL, Kipnis J, Merkler D, Greter M, Becher B. High-Dimensional Single-Cell Mapping of Central Nervous System Immune Cells Reveals Distinct Myeloid Subsets in Health, Aging, and Disease. Immunity. 2018 Mar 20;48(3):599. 4. Mundt S, Mrdjen D, Utz SG, Greter M, Schreiner B, Becher B. Conventional DCs sample and present myelin antigens in the healthy CNS and allow parenchymal T cell entry to initiate neuroinflammation. Sci Immunol. 2019 Jan 25;4(31). 5. Hickman S, Izzy S, Sen P, Morsett L, El Khoury J. Microglia in neurodegeneration. Nat Neurosci. 2018 Oct;21(10):1359-1369. 6. Panza F, Lozupone M, Logroscino G, Imbimbo BP. 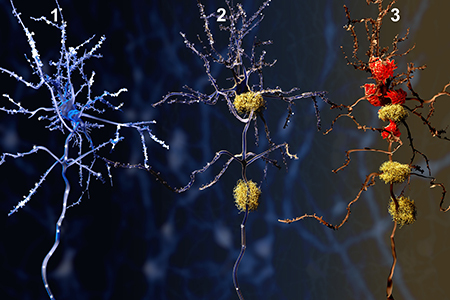 A critical appraisal of amyloid-β-targeting therapies for Alzheimer disease. Nat Rev Neurol. 2019 Feb;15(2):73-88.